When Kamehameha I attempted to unite all eight of the Hawaiian islands, he was successful by 1795 with all but two - Kauai and the nearby island of Niihau. It would take the great King fifteen more years before he was able to subdue the two hold-outs (in 1810). He actually never conquered the remaining two islands. After assembling a fleet of ships to do battle, Kamehameha heard some surprising news. The hold-out chief - Kaumuali'i - had decided to surrender instead of risking more bloodshed. Nine years later, after Kamehameha I died, Kaumuali'i thought he would have a chance to pull the two islands out of the Kingdom of Hawaii. He was unable to do so, however, because Kamehameha's widow - Ka’ahumanu - had her husband's adversary kidnapped. She then forced him to marry her. 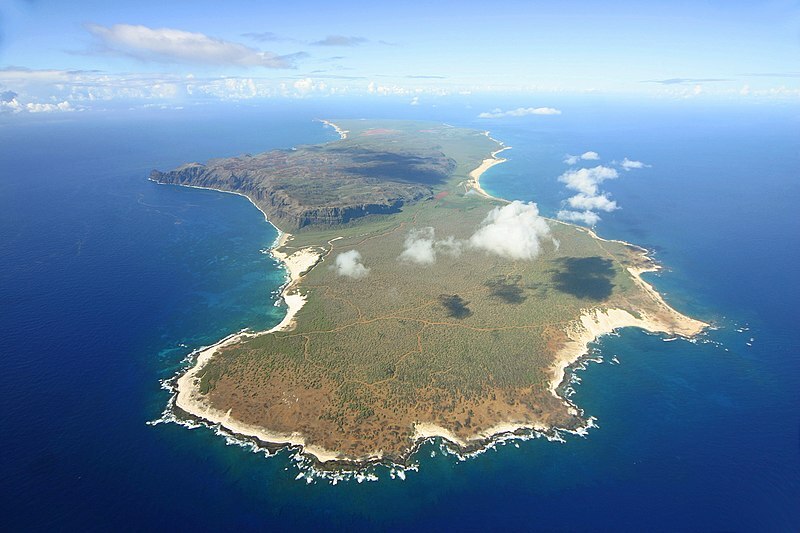 Kauai and Niihau thus remained part of the Kingdom of Hawaii (until it was ended). However ... Kamehameha V agreed to sell all of Niihau, and some of Kauai, to Elizabeth McHutchison Sinclair - in 1864 - for the equivalent of $10,000 in gold. After she died, Sinclair's descendants continued to own the island - and they still do. Sinclair's grandson - Aubrey Robinson - decided to forbid most people from visiting Niihau, and that policy continues. When visitors do come ashore, they generally do not mix with the locals and there are no overnight accommodations. Islanders receive most of their income from the U.S. Navy, which operates an installation at the top of a sea cliff. They also generate revenue from creating special leis made from pupu (small shells which wash ashore during the winter months). It's fair to wonder how such a proposal could have passed muster with the island's owners, given their views about visitors to Niihau. NOTE: The location of Niihau is noted in red on this image. Location map of Niihau, online courtesy Wikimedia Commons. Bos, Carole "Niihau - The Forbidden Island" AwesomeStories.com. Oct 07, 2013. Apr 24, 2019.